Smooth rounded corners make this Side Slot Dog Tag Bottler Opener GREAT to use for Keychains! 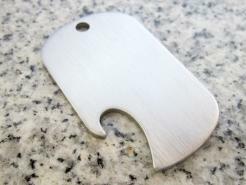 Comes w/ a hole and a brushed finish, can be hand stamped, laser/rotary engraver or impact printer. Made in China.